[AG-TECH] RE: AG Seminar: Fri 30 Nov 2pm, W. Clocksin "Rapid 3D scene modelling from video clips"
Previous message: [AG-TECH] RE: AG Seminar: Fri 16 Nov 2pm, J. Dykes "Interesting? Aesthetic? Useful? 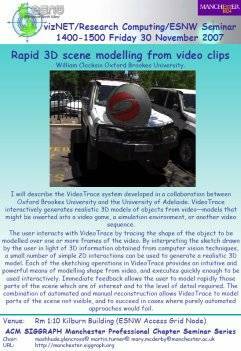 GeoVisualization Perspectives and Examples"
"Rapid 3D scene modelling from video clips"
I will describe the VideoTrace system developed in a collaboration between Oxford Brookes University and the University of Adelaide. VideoTrace interactively generates realistic 3D models of objects from video- models that might be inserted into a video game, a simulation environment, or another video sequence. The user interacts with VideoTrace by tracing the shape of the object to be modelled over one or more frames of the video. By interpreting the sketch drawn by the user in light of 3D information obtained from computer vision techniques, a small number of simple 2D interactions can be used to generate a realistic 3D model. Each of the sketching operations in VideoTrace provides an intuitive and powerful means of modelling shape from video, and executes quickly enough to be used interactively. Immediate feedback allows the user to model rapidly those parts of the scene which are of interest and to the level of detail required. The combination of automated and manual reconstruction allows VideoTrace to model parts of the scene not visible, and to succeed in cases where purely automated approaches would fail. Anyone wishing to view a seminar via Access Grid should note the following. Please check the Jabber room shortly before the start of the seminar to find out whether IGPix or ScreenStreamer is to be used. * Preferably use ScreenStreamer software - go to http://www.memetic-vre.net/software/ScreenStreamer/ScreenStreamer.php, and select room "University of Manchester (1.10)" from the AGSC section. Grab the screen feed (by clicking on it) from the screenstreamer window and resize it - more info can be found on http://www.memetic-vre.net/software/ScreenStreamer. For technical assistance regarding the Access Grid, please contact the Access Grid Support Centre. Non-UK Access Grid nodes are advised to contact the Access Grid Support Centre to check connectivity before the date of the seminar. If possible, please let us know in advance if your site intends to join a seminar.